I was doing a search for gifs and came across this one. 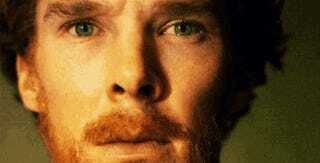 I don't know where it's from, but...hoooooly moly, Benedict Cumberbatch is a beautiful, beautiful man. I'm mesmerized. I want to stroke his facial hair and kiss his cheek and tell him not to be sad. I was already attracted to him. Now, even more so.